Members get exclusive discounts at both: eders.com and at BowhuntingOutlet.com! Members save from 4-45% on all items in both online stores. Membership usually costs $25.00 a year but eders.com is offering this membership to the US First Responders for FREE. 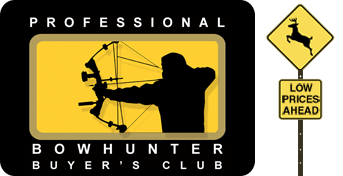 The Professional Bowhunter's Buyer's Club offers members exclusive discounts on archery and hunting items at eders.com and also BowhuntingOutlet.com. The discounts offered to members vary by product but nearly all of the 10,000 items in the both stores are discounted between 2% and 45%. If you are a Member or were a member of a United States Police Department, Fire Department, EMT you can sign up for free!! 1. First add the membership below into your cart and then "check out"
2. After registering/checking out, within 24 hours, eders.com will email you in order to confirm that your status as either a current or past First Responder. 2) Members may not publicly discuss or advertise the pricing for the members as these prices are not publicly available and are meant only as a way for Len and Dave Eder to give back to all of those who have given us so much! 3) This Free Membership is for all First Responders, however we reserve the right to cancel memberships and this program. 4) Signing up for this Free Membership to the Professional Bowhunter Club means you are swearing that you are or have served as a First Responder. False representation as a present or past member falls under the The Stolen Valor Act of 2005, a U.S. law that makes it a federal offense to falsely represent oneself as having received any U.S. military decoration. If convicted, defendants may be imprisoned for up to six months. AAE Max Bond Glue - .7 oz. Fits all stands and all bows. Easily mounts to the stand without any drilling. Keeps the bow in a ready position next to the seat while still giving the hunter a full range of motion on the platform. YOUR LAST CHANCE TO GET THE FREE LIFETIME MEMBERSHIP! For nearly 20 years, we (Len and Dave Eder) have had the pleasure of doing what we love for a living - Selling top quality archery and hunting gear at great prices. To thank the industry that has given us so much we are giving away FREE MEMBERSHIPS to the Professional Bowhunter Buyer's Club. This is our Gift to Archers and Hunters who have helped make our dreams come true.